Shoot the Fokkers is a game which uses the gyroscope feature and it is a first person shooting game. The game has amazing 3D graphics and high definition sound which can kept its users busy with this Shoot the Fokkers. The changes in hardware over the recent time allow users to play games more precisely. Gyroscope is the same change added to the smartphone for racing games to make it more precise and now Shoot the Fokkers is using this feature to enhance the experience of users and help its users to aim at the target to tackle them down. So take a look at the features offered by this game and how this technology will help Shoot the Fokkers to become an addictive game. 1. 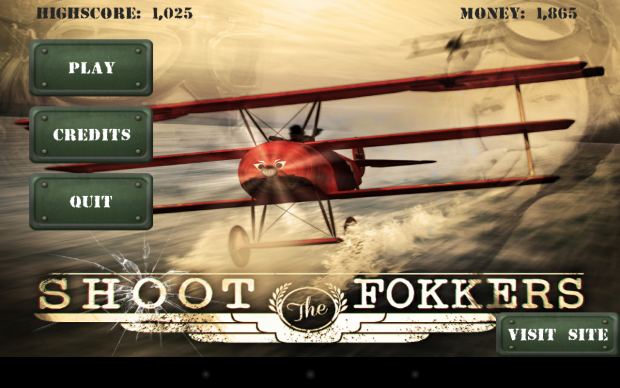 Download and install Shoot the Fokkers in your Android device. 2. Start the game and click on play to start the game. 3. The screen will show you the details of enemy you have to fight with. 4. Hold the screen and aim towards your enemies. 5. Tap on screen to shoot down the enemies. Shoot the Fokkers. Users have to adjust their phone according to the aim and then fire on the enemies to bring them down. There is an interesting feature added to this game is Play to win upgrades which means you don't have to pay for any upgrades instead you have to win the battle and upgrade yourself with new features. Shoot the Fokkers has realistic graphics and users can see online scoring and ranking. Users can connect themselves with their friends using their Facebook account and they can know each and everything about the game play of their friends. The display will show you your score and on the right side at the upper corner it has MENU button which will help you to get back to the previous options. When the color of your plane changes to red and screen starts shattering then you should know that you are in danger and it gives you a realistic experience. WWI is the new settings which is used in Shoot the Fokkers and this type of settings are very rarely used in video games. 1. Don't allow planes to come near you as it will give them chance to destroy you. 2. Add more number of players to enhance the entertainment level. 3.The plane can attack from anywhere so you have to fast and accurate to stop them. According to the users Shoot the Fokkers has infinite potential and the users are ready to pay for Shoot the Fokkers to enable them to use all the features of this game. The users are liking its 3D effects and its way to show the danger to the plane. The increase in sensitivity will allow users to shoot more accurately and adding nice background to Shoot the Fokkers can add a strong point to Shoot the Fokkers. The game has overall rating of 3.9 in Google play. 1. Addition of themes to this game can make it more interesting and colorful. 2. The sensitivity should be increased to handle the plane more accurately. The game is fun and it promises a lot to its users. The game is going to get updated very soon which will help it to remove all the bugs from this game. A decent game with a strong technology of gyroscope needs a little addition to this game to build its position in the market. So you can enjoy Shoot the Fokkers with cool graphics and HD sound quality and help the developers to know what is there to be added to Shoot the Fokkers and share your experience how you like Shoot the Fokkers.